NYC’s financial district is currently experiencing year 2 of Occupy Wall Street and this time, protesters have added ecological and environmental concerns to their agenda. In addition to the fight against financial fatcats, occupiers organized a Storm Wall Street protest yesterday which included groups like the TimesUp! Polar Bears on Bikes, the Solar Panel and the Rising Sea Level Swimmer Brigade. The eco-themed uprising called the event the “99% Ground Swell Against Wall Street’s Debt to Mother Earth” and joined the People’s Wall and 99 Revolutions in the fight against the 1%. To mark the one year anniversary of the occupation of Zuccotti Park, Storm Wall Street protesters met yesterday to bring the message of rising up against Wall Street’s debt to Mother Earth. Together, the group advocated against environmental and economic injustice, rallying for the powers that be to put more focus on issues such as climate change, rising sea levels and the depletion of fossil fuels. Storm Wall Street’s mission is to show the relationship between big banks and environmental destruction, hoping that bringing the issue to the forefront will incite change. The group pleaded for an end to burning fossil fuels, corporate occupation of the planet and basically a hope to create a plan for a sustainable and renewable future. Other issues such as fracking, tar sands extraction and mountaintop removal are also on the docket, with many Occupy Wallstreeters already belonging to organizations that protest these destructive practices. 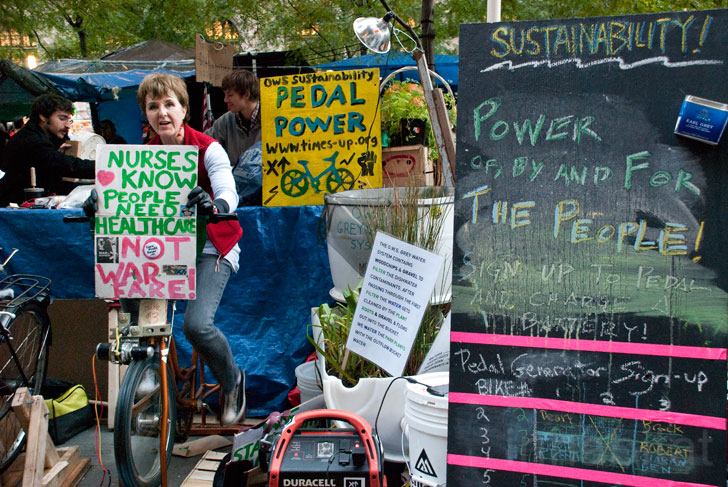 Occupy Wallstreet’s new eco-slant could gain more supporters from around the globe. The media-heavy protests will likely get these environmental issues into the headlines. NYC's financial district is currently experiencing year 2 of Occupy Wall Street and this time, protesters have added ecological and environmental concerns to their agenda. In addition to the fight against financial fatcats, occupiers organized a Storm Wall Street protest yesterday which included groups like the TimesUp! Polar Bears on Bikes, the Solar Panel and the Rising Sea Level Swimmer Brigade. The eco-themed uprising called the event the "99% Ground Swell Against Wall Street’s Debt to Mother Earth" and joined the People’s Wall and 99 Revolutions in the fight against the 1%.